Author: Jon Abbink, Michael Bryant, Daniel Bambu. Series edited by: Wilhelm J.G. Möhlig. 10 pp. Roman, 203 pp. This book on the agro-pastoralist Suri of Southwest Ethiopia is a pioneering collection on a relatively under-documented people, containing historical and linguistic overviews as well as a first selection of Suri oral texts. Several genres of the orature of the Suri are presented in an annotated form. The book thus provides new context information and oral source material of possible wider use to scholars and the wider public as well as to the Suri themselves. Over the past two decades the Suri (approx. 27,000 speakers) – with their spectacular body painting and other customs of decorative culture – have become known as a prime object of the tourist gaze, and were projected in countless modern travel accounts, photo books, magazine pictures, advertisements, and films. These media, primarily being geared to attractive visual imagery and travel literature hyperboles, do not always depict them in an informative or responsible way. This book has the more modest aim of presenting the Suri as a contemporary people in a process of survival and change, presenting elements of their social organization, historical background and way of life, and provides the best introduction to a better understanding of this fascinating group. The authors also indicate some of the problems faced by the Suri in this historically crucial time of change, where many new economic, social and cultural challenges face Southwest Ethiopia and its peoples. For people who want an excellent overview of Suri society, language, and oral culture, this thoughtful and well-written book will be very useful. [...] This book is clearly meant to serve as an introduction to Suri society and oral culture. The book also shows that anthropology and linguistics are not only for a small group of experts, but are also useful to educators, students, and the Suri community in general. As the Suri transition into new – and often unfamiliar – sociocultural contexts, in which their involvement in government school-based education will no doubt increase, the pedagogical value of the book for future literacy programs in Suri will be important. [...] As an anthropologist deeply concerned with the quality of future education projects for agro-pastoralists in South Omo, and especially their ability to fulfill the practical needs of the community, I am grateful to the authors (Abbink, Bryant, and Bambu) for showing readers in such a clear and straightforward manner that a basic understanding of Suri language, society and oral culture is not only useful and interesting in its own right, but a practical first step towards protecting linguistic diversity and cultural heritage in southwest Ethiopia. 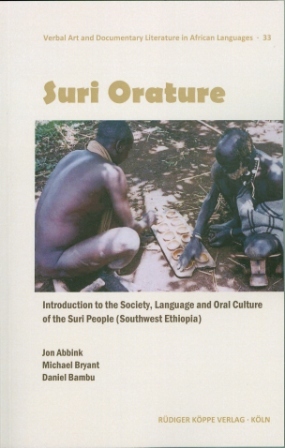 “Suri Orature” succeeds well in its aim to provide an introduction to the society, language and oral culture of the Suri people, and I look forward to future editions of Suri oral texts.